The BQ-280PUR uses environmentally-friendly PUR glue which meets the requirements of Lay-Flat binding for both offset and digital prints as well as coated stock. The large color touchscreen features intuitive icons for easy operation. Simply input book block and cover information at the touchscreen for quick and automatic setup, including carriage clamp, milling, glue tank, nipping, and cover feeder. The automated, sensor-activated digital caliper system ensures consistent measurement of book block thickness every time, eliminating operator discrepancy. Book thickness is automatically measured by placing the book block into the digital caliper. The caliper slides into position with no manual intervention and thickness data automatically begins set-up. 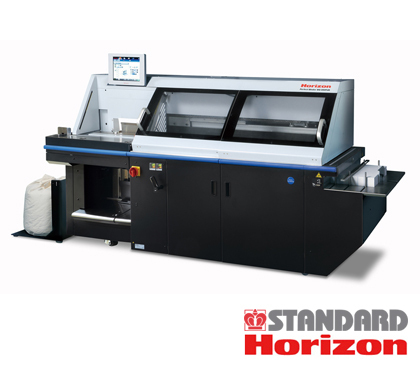 The BQ-280PUR easily handles the production of digitally printed books, personalized photo books, smaller sample runs, and other ultra short-run work! High quality PUR binding is assured with dual application drums and separate EVA / PSA side glue application. Drum application enables production of one to one variable thickness books with maximum quality control. Maximum book size is 15.15" x 12.59" and the maximum book thickness is 2". Built in thickness caliper provides greater production efficiency for instant changeover and variable thickness book production. The BQ-280PUR provides unsurpassed production efficiency in a single clamp binder. Low temperature EVA glue (284 °F or below) can be used. The system can be used for both PUR and EVA with the same tank. Size: 35.7" D x 102.6" W x 60.1" H / Weight: 2,100 lbs.